Hello xat Brandon, thank you for agreeing to be my first interviewee! I’m going to ask you a few questions about what one may call your “private life”. So what’s your real name, where do you live and what are you doing? I live in the United States. My real name is Brandon. Some people on xat are not familiar with this name, and I do get asked what my real name is sometimes. It definitely is Brandon! I’m currently studying Computer Science. Let’s go back to your origins on xat, for how long have you been on xat and how did you discover it? I have been on xat since mid-2008. I used to frequent a website called GameTrailers. I was most active on the forum. That was the first online community that I was largely a part of. At one point, some people of the forum decided to create a xat chat. I remember visiting the chat for the first time and asking how I could get a black star. It felt like there was a lot to learn at first, and this was even before powers existed! The first time I came to xat, I was absolutely amazed at how cool an interactive chat was. As I mentioned previously, there was a lot to learn. I was hooked, and I thought it was pretty fun. I never left! My impression about xat now is that it’s great to see so many cultures and languages intermix. I am always learning new things about other cultures, and I think that’s pretty amazing. Even though I don’t use it a lot, my favorite power is purple. I think the reason why I like it so much is because it was very hard to get when it first came out. It took a lot of work to achieve. When I finally did buy it, I felt like I achieved something not many others did. Of course, purple is not the most expensive power any longer. However, the initial feelings I had about it have stuck with me ever since I first bought it! Time really does fly, but what would you consider your best memory on xat? When was it? My best memory (collectively) is being a Trade owner. I was a staff member at Trade from 2009-2011, and I was an owner from 2010-2011. During that time frame, xat was growing a lot and was coming out with a lot of interesting powers. I was the third owner that Trade had seen, and I took it pretty seriously. I think Christina knew how much I wanted to be a Trade owner. I tried to hide it, but I was very excited about it. Luckily I was in it for all the right reasons. The reason I fondly look back at that time is because I met a lot of friends at Trade. I always had a fun time chatting with other moderators, catching scammers, and keeping the blog updated. We all know you like to help people and have a lot of good friends on xat, but who do you really trust a lot on xat? I trust JoshuaRivenbark a lot, among a few other people. JoshuaRivenbark has been on xat for a very long time, and I have found that he is always true to his character and will not risk his integrity. He’s an honest person. A lot of people on xat appear honest, but it is rare find someone consistently as honest and good as JoshuaRivenbark. There are two users who I have brought into my personal life, but I will not name them. The first one is someone I met at Trade in early 2009. He was one of the earliest moderators, but I am sure that very few people (if anyone) would remember him even if I mentioned his name. He is very close to me, and we still chat every single day. He quit xat in 2009 though and has not returned. Here is the essential part. 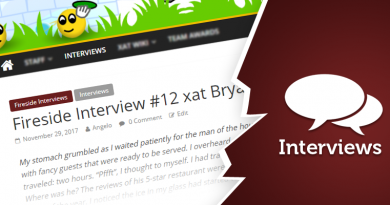 You’re well-known as a Volunteer, Main of Help, Wiki Editor… but what is your main role on xat? It’s hard to say what my main role on xat is, since I have many roles. I like to think of my main role as a general volunteer for xat who does many things to help out. Let me ask you few more precise questions on what you do on xat. When did you become volunteer on xat Brandon and was it a goal to reach? I became a volunteer in July of 2015. Yes, becoming a ticket volunteer was definitely a goal that I was reaching for. It took a lot of hard work, but I’m glad that I’m finally able to help people at a greater capacity than before. Did that change your chatting experience on xat? Before I became a volunteer, I always told myself that I would not change my chatting experience once I became a volunteer. It seems that when someone becomes a volunteer, they begin to chat less and less. Messages tend to be brief, and they seem hard to reach or talk to. I don’t want people to get that impression of me, so I haven’t really changed anything with respect to my chatting experience. Did you have a role model that motivated you to go ahead before becoming a volunteer on xat Brandon? This is a difficult question to answer! Throughout my years on xat, I never really looked up to too many people. This is because I didn’t always have aspirations to become a volunteer or get too involved in xat, so I never really considered looking up to someone. The past couple of years I have gained a lot of knowledge from more senior volunteers, and I would say I look up to some of the volunteers a lot. How and when did you become a wiki editor? What is your role on the wiki? I became a wiki editor in July of 2015, because that’s when I became a ticket volunteer. I don’t have a large role on the wiki, even though I would like to. I keep track of a lot of ideas I have, but I am not ready to suggest or implement them yet because I feel like I need to develop those ideas more. I think the wiki can be more professional than it is now. What do you think of the recent evolution of the wiki? I am not a fan of the wiki as a form of self-service for users, as it is not a very professional-looking support interface. The wiki team does its best to make it look professional though. The wiki is very good at helping people in multiple languages, but I feel the wiki lacks in a few areas. For one, there are no editing or style guidelines. Some of the articles are also very large. For a support article to be effective, it should be short and concise. It seems that the wiki is used as a form of documenting every single feature on xat. I don’t think all this information needs to be on there. It should (mostly) contain information pertinent to helping people resolve common problems they encounter but I do think the pages for powers are well-designed and informative. For the wiki to improve, I feel like there needs to be a more established leadership. The leadership should be willing to establish a manual of style that is easy to follow. This would help promote more professional wiki articles. Ideally, they would also be more willing to accept new wiki editors. The group seems very closed off at the moment, and I don’t get why. The current setup is not in the spirit of MediaWiki at all. I believe the problem is that becoming a wiki editor is often seen as some great achievement or stepping stone to becoming a ticket volunteer. It is something very difficult to achieve. Why though? I have never understood it. This sentiment is what holds back the wiki, and it’s a shame. However, do you have a favourite editor? My favorite editor is Andre. He is extremely helpful to the entire team, and he does not get thanked enough. You also were main on xat_test, how was it? My month at xat_test was very interesting. Looking back, I don’t think I would want to repeat it. Believe it or not, it can take a lot of energy out of you. Suddenly jumping into a position of leadership is a big deal. There were constant issues of drama, and I had to make some hard decisions. How did you discover you were the Main Owner of the month? Christina came to me and asked if I wanted to be the next Main Owner of xat_test, and I happily took the offer. She emailed me the link to become the Main Owner, and the rest is history! I don’t visit xat_test too much. Usually I go there to make some temporary moderators if it’s needed, or change the outer background at the request of the current Main Owner. I have a neutral feeling about the chat. What is your favorite form of support, as you’ve got a role in each one? My favorite form of assistance on xat is the Help chat. The wiki, forum, and ticket system are all very informative and helpful, but I feel that the team at Help is very dedicated to providing quick and quality support for anyone who needs it. Resolving issues immediately is very important, and the Help chat accomplishes that. So I guess Help is also your favourite chat, right? Yes. I manage that chat, so hopefully it would be my favorite! I put a lot of work into managing it and making sure everything is running smoothly. How and when did you become Main Owner at Help? I became the Main Owner of Help in June of 2015. With a large amount of support from Jesse, the administrators agreed that I could manage the chat. I’m glad I was given that opportunity and was given the chance to implement all the great ideas I had. Was it a goal to reach for you? At the time, becoming the Main Owner of Help was not a goal. I was not expecting it at all, so I did not have it set as a goal. I felt as if it was far out of my reach, so I didn’t really consider it. What did you bring or change when you became Help’s Main Owner? I haven’t actually talked about this a lot with anyone, but I had an entire action plan written out that included all the changes I wanted to make. The first thing I did was clear up almost every single rule. I feel like I really made the rules solid and easy to understand. 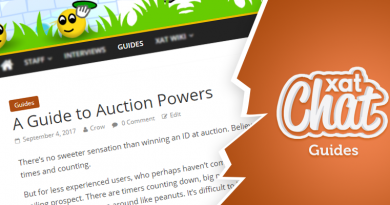 They are now very detailed, and it has helped moderators properly enforce rules. Before, there were a lot of areas of concern. I also introduced a lot of policies for staff members so that users could get help under a more professional atmosphere. I must add that my current team of owners is pretty darn great though. First , Congrats at Brandon and Verite to become vools! and good work! xat.com its a place to meet ppl to chat to help! Without Vols xat can not run! Enjoy! Anyone gonna be doing another interview?